MOSCOW, February 19. /TASS/. Russia’s foreign ministry on Monday summoned the Ukrainian charge d’affaires in Moscow to make a representation over attacks on the Russian Center for Science and Culture and offices of Russian banks in Kiev. 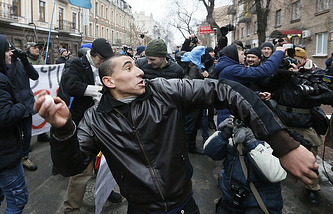 "The Russian foreign ministry summoned Ukraine’s Charge d’Affaires in Moscow [Ruslan] Nimchinsky to make a resolute protest over ongoing outrages of Ukrainian nationalists and Russophobes who staged, by the behest of the Kiev authorities, provocative attacks on the Russian Center for Science and Culture, the office of Rossotrudnichesto agency and offices of Russian banks in Kiev on February 17 and 18, 2018," the Russian foreign ministry said. "It was noted that rowdy radicals were breaking windows, writing insulting signs on the walls, desecrating Russian state symbols and doing other damage while the police opted to act as mutes and not to interfere," the ministry said. "The Russian side has demanded to pinpoint and bring to responsibility all those responsible for the above active hooliganism," the ministry said. The Russian foreign ministry described these attacks as yet another manifestation of "growing aggressive nationalism of the neo-Nazi nature, which is openly supported by the country’s official authorities." "It seems to be no coincident that the attack on the Russian Center for Science and Culture was stages immediately after Ukrainian President Pyotr Poroshenko’s odious speech at the Munich Security Conference, which was overfilled with anti-Russian pronouncements and openly called fight against the Russian flag across the globe," the ministry said. "Ukraine’s deliberate choice to be one of only two world nations voting against the United Nations General Assembly resolution against glorification of Nazism, neo-Nazism and other discriminatory practices demonstrate which side the current Kiev regime has chosen." Moscow expressed regret Europe and the United States obviously ignored the "tragic lessons of last century." Aggressive nationalism in Ukraine does not evoke proper response from the West, the ministry said. 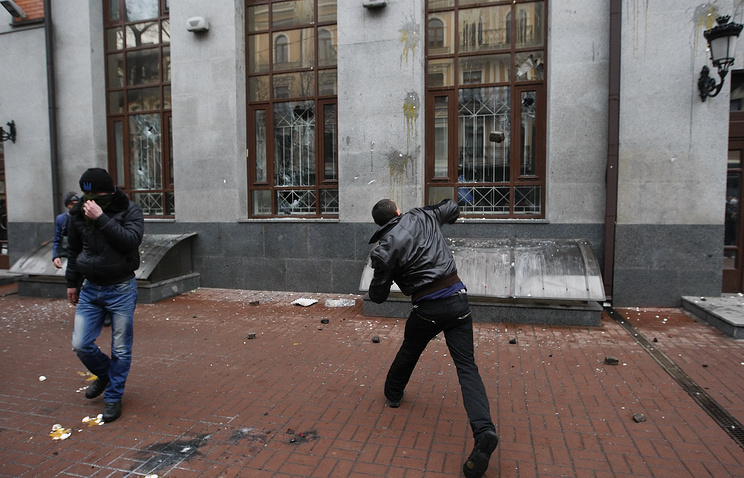 On February 17 and 18 Ukrainian nationalists staged provocative attacks against the Russian Center of Science and Culture and the office of federal agency for the Commonwealth of Independent States (Rossotrudnichestvo) in Kiev. "One cannot but feel alarm over the fact aggressive nationalism in Ukraine does not evoke proper response from the foreign handlers of the authorities in Kiev," the Foreign Ministry said. "Moreover, in some cases such sentiment is being encouraged."